It’s that time of year again when we anxiously wait to learn who will be awarded a Nobel Prize for 2016. As highlighted in previous blogs, life for scientists such as Marie Curie, Richard Feynman and Allan Cormack changed dramatically after they became Nobel laureates. For the past 25 years, editors at the Annals of Improbable Research have awarded the Ig Nobel Prizes that are parodies of the real awards and are given for research that is unusual or apparently trivial. 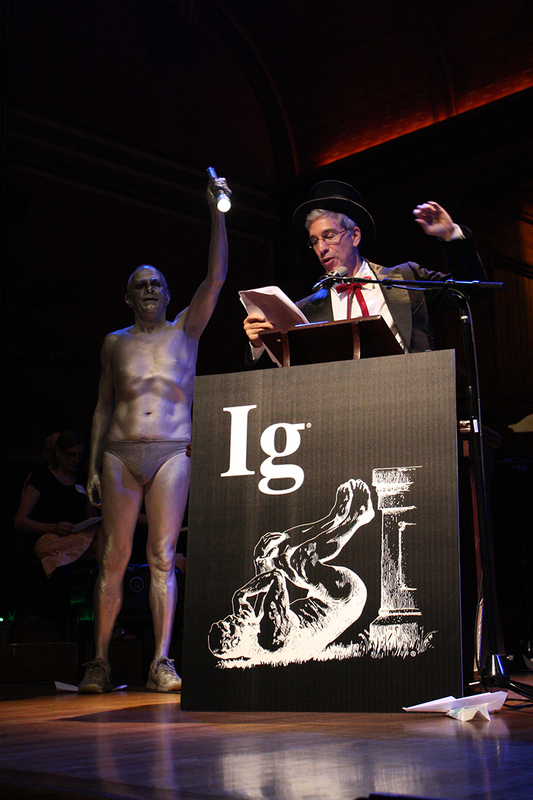 Last week the Ig Nobel Prize ceremony was held at Harvard University where the master of ceremonies was Marc Abrahams, editor and co-founder of the Annals of Improbable Research. The chemistry prize was awarded to Volkswagen “for solving the problem of excessive automobile pollution emissions by automatically, electromechanically producing fewer emissions whenever their cars are being tested.” Not surprisingly, nobody from the car company was present to accept the award! One person who was in Boston to accept his $10 trillion prize – a Zimbabwean banknote with no value as a result of that country’s hyperinflation – was Thomas Thwaites who won the biology prize “for creating prosthetic extensions of his limbs that allowed him to move in the manner of, and spend time roaming hills in the company of goats.” As seen in the photo above right, he also demonstrated a willingness to chew grass! The prize for medicine was awarded to a team of psychologists and neurologists from the University of Lübeck in Germany who had published their findings in PLoS ONE in 2013. First they produced a mild itch by injecting a chemical under the skin in the arms of human volunteers. Then they discovered that if you have an itch on the left side of your body, you can relieve it by looking into a mirror and scratching the right side of your body – and vice versa.